Known as one of the top Cloud ERP applications on the market, Acumatica Construction Edition now offers real-time cloud-based accounting functionality to contractors, subcontractors, home builders, and land developers. Acumatica Construction Edition helps you improve margins and project control at all stages of home, multi-family, commercial, mixed-use, land development, and government projects. Project Management – A complete view of the project details that provides updates to the management team with any changes from the customer or the field. Job Costing – Enhanced costing tracks codes, types, and sub-jobs to keep project management and accounting in sync on actual and standard costs. Workflows – Use the standard workflow or create custom workflows for large projects, including estimating, scheduling, and approvals with electronic signatures. Contracts – Links between contract details and sub-jobs in the project plan include all addenda and change orders. Project Billing – Confirm details and automatically generate pro forma, progress, and time and material invoices from one screen, including quick billing. Change Management – Control changes of the project budgeted and committed values and control the profitability of every change initiated by a customer. Retainage – For both accounts receivable and payable, manage initial retainage and any changes to streamline invoicing and payments. Retainage tracking is supported for progress billing and time and material billing of projects. Payroll – Support multiple unions, locals, classes, benefit packages, and complex wages, as well as certified wages and executive compensation. Manage new build, remodel, service, and warranty projects from one, end-to-end system for plumbing, HVAC, electrical, mechanical, and other trades with contractor software from Acumatica. Reach company objectives from site development through home design, build, and warranty management. Maximize the value of mixed-use, residential, retail, and commercial projects from excavation through infrastructure. 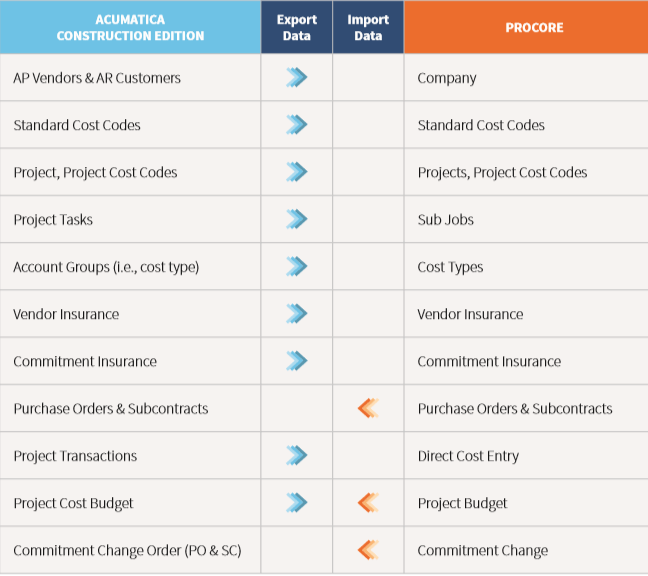 The power of Acumatica Construction Edition with Procore gives customers the ability to seamlessly share accounting and project data between the office and field. This includes easily exporting and synchronizing records between Acumatica and Procore for customers, vendors, projects, cost codes and more! Together, Acumatica and Procore enable construction firms to streamline time-intensive processes and drive their business forward. Leave your name below. One of our Acumatica Construction Software consultants will follow up with you shortly.